An ancient utensil, still common in some cultures, that is used to grind or tenderize grains or other types of foods before consumption. The typical metate consisted of a flat stone with a depressed or worn surface where the food substance could be placed and ground against the hard surface to soften or crush the item being prepared. Similar to a mortar and pestle, the flat stone became the mortar while a hand tool made of stone or wood, much like a pestle, was used to grind the food against the surface of the stone. Another tool similar to a Metate that continues to be used for grinding food is the Lava Rock Molcajete that is bowl shaped. 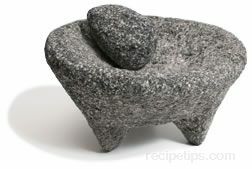 The Molcajete was used for smaller amounts of food while the Metate allowed for a larger working surface for grinding.